The destruction of the Holly Square Shopping Center in May 2008 as a result of gang arson left a major void in the heart of this proud community. Together with support from the City of Denver, ULC acquired the 2.6 acre site in 2009. ULC immediately commenced an extensive community engagement process to determine future redevelopment plans. Today Holly Square is a vibrant community hub, catering primarily to children. 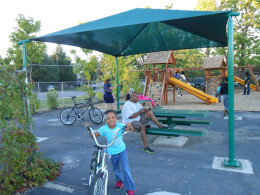 The site is home to the Jack A. Vickers Boys & Girls Club in the Nancy P. Anschutz community center, Roots Elementary School and a new outdoor gathering space for the community. 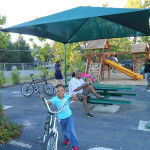 Local Children Use Holly Square Futsal Courts – Watch Video!